by Chris Woodford. Last updated: August 3, 2018. Static electricity can be brilliantly useful: photocopiers and laser printers wouldn't work without it. But think about lightning for a moment and you'll see it can also be pretty scary. Although static isn't harmful by itself, when large amounts of it build up and suddenly discharge you can get dramatic and dangerous sparks (it takes about 3000 volts to make a spark just 1mm long). Set off a spark where there's something flammable (such as gasoline fumes) and, before you know it, you've got yourself a fireball and an explosion. You don't need lightning-sized amounts of static to cause problems: even a tiny spark can be problematic in some situations. If static has built up on your body through walking on a rug, and you start handling delicate electronic components, the sudden discharge of current from your body can be enough to cause some very expensive damage. That's where anti-static products can help. Let's take a closer look at how they work! Photo: This alarming fire was caused when a spark ignited the gasoline fumes from a fuel truck. Photo by Adrian Cadiz courtesy of US Air Force. Where does static come from and where does it go? Photo: Static electricity and electronics don't mix! 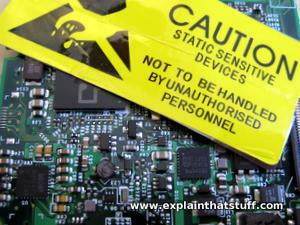 Electronic components often come in anti-static bags with warning labels like these attached. The bags, which are a sort of smoky silvery color, are made of plastic with conducting additives mixed in. When they're sealed up, they form an outer protective case known as a Faraday cage. It's a basic rule of physics that there are no electric charges inside a hollow conductor (which is what a Faraday cage is), even when it's charged up on the outside. So a bag like this effectively protects its contents in transit. If you've read our main article on electricity, you'll know that static electricity is (as the name suggests) a kind of electric charge that stays in one place—it really is static. It's the opposite of current electricity (also called electric current), which is electricity that moves from one place to another along a definite path called a circuit. Static generally builds up when insulators (materials that don't conduct electricity very well, like plastics, rubber, and so on) or insulated conductors are rubbed, such as when you rub a balloon repeatedly on your clothing. You'll sometimes see this referred to as the triboelectric effect—from the Greek word tribos meaning rubbing—though that fancy expression doesn't really add much to our understanding: it's not the rubbing that's important, but repeatedly bringing the different materials into contact (which rubbing achieves very effectively). You can read a full explanation in our article about static electricity. Static electricity can be really useful and we harness it in all kinds of practical ways. When you take a flash photo with your camera, for example, you have to wait a few seconds for static electricity to build up in a capacitor (an electricity storage device). Once the capacitor in your camera is fully charged, a light comes on, and when you press the shutter button, the capacitor discharges rapidly through a powerful xenon bulb, creating a brief flash of light and often a surprisingly loud crack, like a mini bolt of lightning. What's happening here? To get rid of static electricity, we have to turn it into current electricity by creating a circuit. That's what happens in lightning: so much electric charge builds up in a cloud that the air between it and the ground no longer acts as an insulator. Effectively, the air suddenly turns into a giant circuit that becomes visible—as a lightning strike—as the electricity flows down it to Earth. To stop static, you have to ensure electricity never has a chance to build up. In other words, you have to make sure there's an electric circuit of some kind to carry any electric charge harmlessly away. Anti-static products do this in all kinds of different ways, sometimes physical and sometimes chemical. You've probably seen cars driving along with little black strips dangling down from the back touching the road. A car's metal body, riding on rubber tires, builds up a static charge as it drives down the road with air rubbing past it. The theory is that strips like this prevent static electricity from building up on the car body, reducing radio interference, electric shocks when you open the doors, and car sickness. Do these strips work? No, they're entirely useless. In the 1980s, English trading standards officers prosecuted a company for selling anti-static strips because they simply do not work as described: car tires are 10 million times more effective at transmitting static charges to Earth (New Scientist, 4 July 1985, p.63). But even if they did work, one thing is certain: to do anything useful, they must be connected both to the metal car body and touching the ground, completing an electric circuit between the two—and if they're dangling in mid-air (as many of them are) they're a complete waste of time. 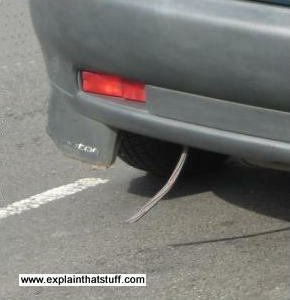 Photo: An anti-static car strip. Look closely and you'll see a zig-zag of copper wire running across the surface. This is what supposedly carries the static electricity to the ground. In practice, although rubber is an insulator, car tires do conduct electricity to a certain extent, making devices like this entirely redundant. If static electricity really is a problem on cars, imagine how much more of an issue it is on airplanes, flying at greater speed and with much more surface area brushing through the air. You may not have noticed, but many planes have little carbon-fiber rods or wicks placed at the back of the fuselage to concentrate static electricity into a point and discharge it more effectively. They also help to dissipate electric charges if a plane is struck by lightning in flight. There are some good photos of the wicks on a Boeing 737 on this page from aerospaceweb. Photo: This very similar idea for an anti-static shoe is much more plausible, because plastic-soled footwear really does insulate and we all get static shocks from doorknobs from time to time. The idea is simple: a zig-zag pattern of conducting wire (red) runs underneath your foot (collecting charge from your body) to some discharge bristles, touching the ground at the back of your shoe. 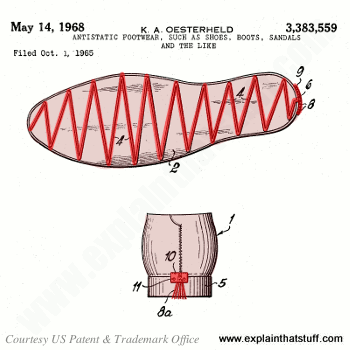 Artwork courtesy of US Patent and Trademark Office from US Patent 3,383,559: Antistatic footwear by Karl Oesterheld, May 14, 1968. Static isn't just a problem for vehicles that move; it can affect moving people as well. If you have floor coverings made from synthetic fibers, you probably get a static charge every time you walk over them. That's not normally anything to worry about, but it can be a problem if you're working in an office with sensitive electronic or computing equipment. That's why, if you're soldering sensitive electronic components into a circuit, it's usually a good idea to wear an electrically conducting wrist-strap to carry any static safely to Earth. Factories and work places often use anti-static flooring (rubber mats or carpets) to save the need for everyone to wear straps. They look just like normal floor coverings, but they're made with a good proportion of electrically conducting carbon fibers dotted among the ordinary rubber or nylon (synthetic plastic) fibers. Anti-static floors are cleverly designed so that they safely dissipate static charges without dangerously allowing stray voltages to electrocute people in the case of an electrical accident. How do they "know" the difference between electricity that should be stopped and electricity that needs to flow? One design uses very thin copper strands surrounded by even thinner plastic sheaths. If someone is electrocuted standing on one part of the floor, at a typical household voltage, the sheath is thick enough to stop the current flowing through the material and electrocuting other people nearby. But static electricity typically involves much higher voltages, so the sheath's insulation will fail in this case, and any current will flow away harmlessly through the copper strands to ground. Photo: Take precautions against static when you need to handle delicate electronic components. 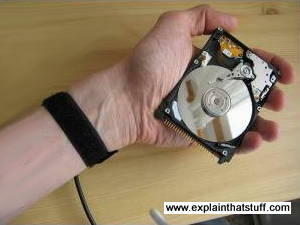 Either ground your body (briefly touch something like a metal radiator or other properly grounded/Earthed connection) or wear an anti-static wrist strap if you plan to handle components and circuit boards for a while. The black wire you can see at the bottom runs from the conducting strap around my wrist to a ground connection. These are physical solutions to the problems caused by static electricity, but there are chemical solutions too. In fact, if you look through the US Patent and Trademark Office database, you'll find that the vast majority of anti-static "devices" are chemical additives or coatings designed to make materials less prone to the problems of static. Anti-static spray coatings typically consist of a conducting polymer (plastic) and a solvent made from deionized water and alcohol. When the solvent evaporates, it leaves behind an invisibly thin conducting "skin" on the surface of the object that prevents static build-up. Some washing detergents also have additives to reduce static crackling in synthetic fibers (used in clothes made from materials such as polyester). They work by allowing the fibers to retain a little moisture, which makes them more electrically conducting and reduces the chances of static building up. Very simple—and very effective! Photo: Anti-static plastic = fantastic! Here's one way that chemical additives can make plastics anti-static. In this case, the additive is made of polar molecules (ones with uneven electric charge, so they have positive and negative ends). 1) These molecules (shown here in red) migrate to the surface of the plastic with their negative ends pointing out. 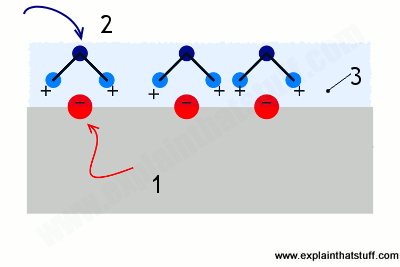 2) Water in the atmosphere (H2O, shown in blue) also has polar molecules, whose positive ends are attracted to the negative ends of the additive. 3) The moisture forms a thin, electrically conducting film that acts as an anti-static coating. Pipelines and hoses are another place where static electricity can cause problems. Static is a particular concern in pipes that carry flammable chemicals, but it can also be a nuisance in ventilation or cleaning pipes where a buildup of static can cause a gradual accumulation of dust and blockage. Most pipes are now made of plastics, which only adds to the problem. Anti-static pipes avoid static buildup either with conducting additives added to the plastic or a coil (or line) of highly conducting wire (typically something like copper) running through them. They can usually be connected to ground at intervals as well. Putting additives in plastics can certainly solve the problem of static, but it may create other problems in the process. If a plastic is used as a food packaging material, for example, any additives have to be nontoxic and safe. Additives like carbon black may radically change the color of a plastic, affect its strength, or alter its physical properties in other unhelpful ways. So there sometimes has to be a degree of compromise between making a plastic anti-static and ensuring that it still performs well in other ways. Hazards of Electricity and Static Electricity by BP Safety Group. Institution of Chemical Engineers, 2006. Covers the risks of sparks, explosions, flash, and blast hazards caused by static (and mainly aimed at the petroleum industry). Electrostatic Hazards by Günter Lüttgens and Norman Wilson. Butterworth-Heinemann, 1997. Explains how static electricity accumulates and becomes a source of ignition and/or explosion. Cool Experiments on Static Electricity by Baby Professor. Speedy Publishing, 2017. A good book for parents to work through with younger children. Ages 6–9. Eyewitness: Electricity by Steve Parker. DK (Dorling Kindersley), 2013. General introduction to the science and history of electricity for ages 9–12. Electricity and Magnetism: Static Electricity, Current Electricity, and Magnets by John Beaver and Don Powers. Mark Twain Media, 2010. A combination of student and teacher guides in a single book. Ages 10–12 (US grades 5–6). Charging About: The Story of Electricity by Jacqui Bailey and Matthew Lilly. Bloomsbury, 2004. A picture-book-style history, broadly suitable for ages 5–10. CSB Safety Video: Static Sparks Explosion in Kansas: This interesting video from the U.S Chemical Safety Board (CSB) is a superb case study of the static-spark explosion and fire that broke out at Barton Solvents in Kansas in 2007. It shows how the fire happened, despite the firm taking conventional anti-static precautions, and how the risk of handling nonconducting flammable liquids can be minimized. 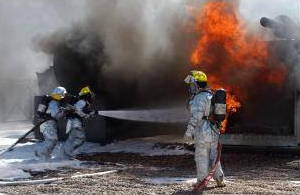 Static Fires Are a Peril at the Pump by Marcia Bieder. The New York Times, July 27, 2008. Are gas-pump fires an urban myth? Far from it. Slides: A Playground Menace by Randy Dotinga. Wired, June 8, 2006. Metal playground slides can generate enough static electricity to damage cochlear implants in deaf children; antistatic coatings seem to be the answer. Cell-phone fires: a lot of static by Elisa Batista. Wired, March 25, 2003. Can cellphones start fires at gas stations? Not according to this article. US Patent 4,899,521: Antistatic thermoplastic/polyamide-polyether compositions and antistatic polymeric films made therefrom by Marvin R. Havens, W. R. Grace & Co. Issued February 13, 1990. Describes an anti-static film made from a blend of polyether block amide copolymer and an aromatic sulfonamide antistatic agent. US Patent 4,214,035: Antistatic coated polyester film by John M. Heberger, American Hoechst Corporation. Issued July 22, 1980. US Patent 3,639,807: Low-static carpet by Thomas B Mccune, Hudson Wire Co. Issued February 1, 1972. A typical anti-static carpet made from a mixture of conducting and non-conducting yarn. US Patent 3,650,816: Additives for clothes dryers by Jerome Rudy et al, Lever Brothers Company. Issued March 21, 1972. Describes a chemical that you spray into clothes tumble dryers to reduce static cling.